One of the more popular 35mm film cameras on the second hand market is the adorable Contax Aria. It is the lightest Contax SLR ever designed, and one of the last film cameras produced by the company before closing its doors. It is a truly nimble SLR that accepts the full line of Carl Zeiss lenses. And the funny thing is, its design intentions were driven by female appeal. Contax Aria with Zeiss 45mm f/2.8 Tessar pancake lens. Photo by Derrick Story. Contax cameras were known for their robust design and heft. I have a Contax ST that I just love. And if I need to, I can pound nails with it as well. It is solid. But, back in the 1990s, women were't going for the large, somewhat heavy design. So Contax started from the ground floor and created a camera that was smaller, lighter, and well specified, but not overly so. And they even gave it a pretty name: The Aria. Then to sweeten the pot, they cut the price in half as well. The upshot was that men, not women, loved the camera. It packed all the features they wanted in a more nimble package. And it remains popular to the day. Generally speaking, Contax Arias sell for about the same price now as they did decades ago at introduction. Nobody owns the crystal ball for consumer electronics. But I find it interesting that photographers craved nimbleosity long before I launched my campaign. And thanks to the effort to appeal to female aesthetics, we still have one cool film camera available these days that packs lots of power into a compact, portable package. I've received a few notes from workshop attendees wondering if we're still having the TDS Fall Color event scheduled for October 26. The answer is yes. And I'm moving forward with everything else we've planned for the remainder of the year and in to 2018. There's no reason not to. 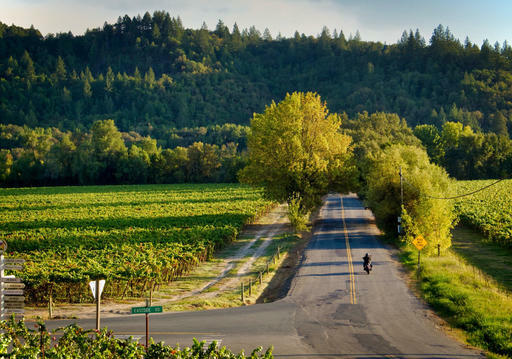 Anyone who has lived in Sonoma County for any period of time knows that we're already putting the pieces back together. True, the fires are not over yet. But we don't really have time to wait around for the all clear signal to get to work. Many of us haven't had a home to go to since 1 AM Monday morning. And true, our productivity right now isn't what it will be soon. We have to spend big chunks of our day helping others less fortunate, finding services, and dealing with rustic living conditions. That being said, we are all working. Yesterday, I was able chip away at projects that didn't require connectivity or electricity. I photographed new items for TheFilmCameraShop, filled a couple orders, worked on the new version of the Wine Country Workshop, published on social networks, and helped my displaced family members. As soon as I get power back at the studio, I'll start recording again. We will have a podcast this coming Tuesday. I will be ready for everyone when they arrive for the workshop in two weeks. We have a hashtag going around here, #SonomaStrong. That pretty much sums it up. We have a lot of work to do in the coming months. We'll get it done. That's what we do. Dogs are attached to their masters and cats connect with their homes. 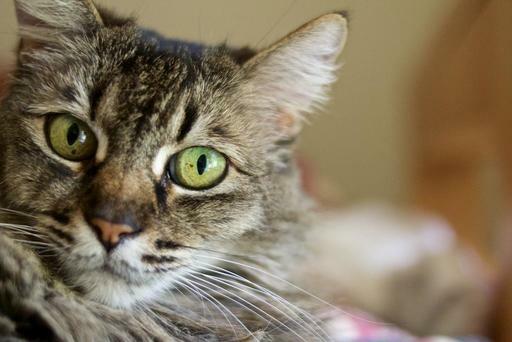 For Dibs the studio cat, she's going to have to think more like a dog for a while. Dibs is on the road with us as we continue to stay one step ahead of the fires in Santa Rosa. We picked her up at the studio 1am Monday morning when we had to leave our house, thinking that my workplace in the middle of Santa Rosa would be safe. She was there waiting for us. That's her home. An hour after we set up shop at the studio, we were notified that we had to evacuate again, and that included the cat. She hates traveling. Every car ride equates to a trip to the vet. But there was no negotiating this journey, and she seemed to know it. She sat quietly while we worked through traffic again in search of our next safe zone. Our second stop was Theresa's Dad's place in Bennett Valley. It was up on a hill where we could see the fires down below. We all spent a night there, until another evacuation notice arrived the next afternoon. A separate fire, the Nunsvalley blaze was approaching from the east. This evacuation was mind-numbingly slow. There are few routes out of Bennett Valley, and everyone got the notice at the same time. Once again, Dibs was riding shotgun in my car. By this point we had a caravan of family as well: Theresa, her dad, her older brother and sister in law (who had already lost their home), and her younger brother. This time we were heading to Forestville. There was enough room for us at a rustic cabin. We all found a place to sleep. Dibs is starting to get the hang of this travel thing. Now, once introduced to her new accommodations, she calmly surveyed the scene, then looked a me as if to say, "OK, this will do." I never thought that Dibs would become a road warrior. But she's evolved into a "have litter box will travel" kind of cat. I'm happy to have her with us. No band of gypsies is complete without a kitty or two. PS: She may be packing her kibble again. We just heard a fire flared up West of Santa Rosa. At the moment, our family is safe on a ridge in Bennett Valley. We're lucky in the sense that we didn't have to go to an evacuation shelter, although there were moments yesterday when we thought that might change. Meanwhile, the fires in Santa Rosa are as dangerous as ever. I'm fairly certain that my brother-in-law (and one of my best friends) lost his house. He and his wife are staying with her mom in Forestville. They had to leave with the clothes they had on, and nothing else. They are going to need our help in the coming days. My sister-in-law may have lost her place as well. We can't know for sure yet, because all of our places are located in a mandatory evacuation zone in the North of Santa Rosa. 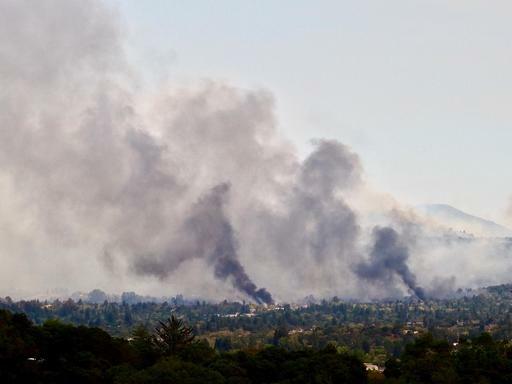 When the fire blazed south from Calistoga, fueled by 50 MPH winds, we were in its path. She is staying with friends right now. We don't know about our place yet. Yesterday, we stood outside the border of the evacuation zone, patrolled by officers, and looked at the treeline and the roofs of places we knew. There's a chance that we may be the luckiest of our family. But it's too soon to tell, and the fires are still burning. At the moment, our only connectivity is through our iPhones. Comcast has been down. And there's no power through large areas of the city. The smoke is choking, and it's unsafe outside. The air is still right now. There's no visibility. As most of you have already figured out, there won't be a TDS Podcast this week. In so many ways, there just isn't enough bandwidth. But I'll keep you posted. Be sure to follow on TDS Facebook page and via my Twitter feed. No one loves mobile photography more than me. But my toolset goes beyond the iPhone, even though it remains an integral part of the workflow. What I also like is the act of rotating knurled dials, pressing physical buttons, and looking through a viewfinder. 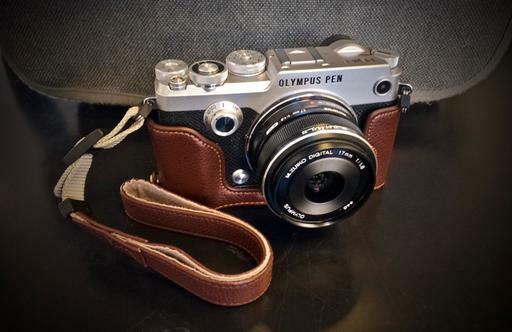 I like the way a well-designed camera with a half case and wrist strap feels in my hands. It makes me want to use it. And thanks to WiFi, I can still quickly send the picture to my iPhone and publish on Instagram in just a minute or two. The fact that maybe I can enjoy a cup of coffee during the process just makes it all the better. I just returned from 3 days of driving around Silicon Valley covering events and taking pictures. I used my iPhone all of the time. At moments, it was my camera, and other times it was my publishing conduit. But when I could, I also reached for the PEN-F. And in the end, I captured more images with it than my smartphone. And I love those shots. My point is, we don't have to limit ourselves to smartphones, no matter how wonderful they are. There are moments when I want photography to be more than simply tapping a screen. And that's what keeps me enthused about this craft. This is The Digital Story Podcast #604, Oct.3, 2017. Today's theme is "The Joy of LED Lighting." I'm Derrick Story. 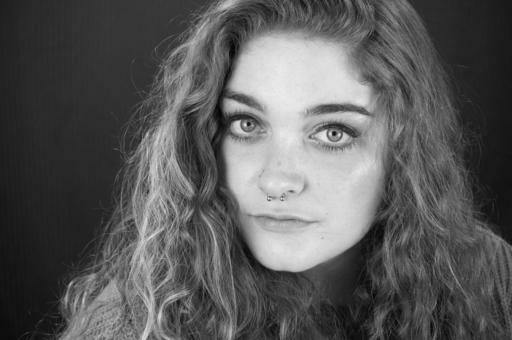 I'm working on a series of studio portrait shoots for a project, and have been leaning heavily on my LED lights. They have been serving me well both in the studio, and on location, and I thought now would be a good time to revisit this affordable, versatile, lighting solution. My current favorite LED light is the Genaray LED-7100T 312 LED Variable-Color Light for $189. The kit includes the light, two batteries, a diffusion panel, a charger, and a nice case. It's portable enough for location shoots, yet powerful enough to use in a studio softbox. 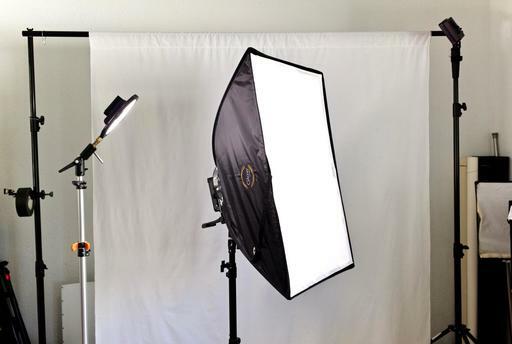 So I thought I would share five reasons why I'm preferring the LED array to traditional strobes. Continuous Lighting with a Broad Source - What you see is what you get. And the bigger panel with diffuser means I don't always need modifiers. Color Adjustable - All I have to do is turn a know to adjust the temperature of the output. And it's so easy to calibrate them to the ambient lighting in the scene. Long Battery Life - I charge the set of duo batteries before the shoot, and they last for the entire session without having to change them. Cool to the Touch - Even though the lights are always on, the room doesn't heat up. More Affordable than Most Strobes - A dedicated flash can cost $350 or more. These LED panels are less than 200, including batteries. I still carry a flash in my camera bag with an extension cord. Because there are those times when I need the power or portability. But given a choice, I tend to reach for my LED lights whenever possible. And I love them! Petapixel published this article that explains how to create amazing big group shots by breaking down the subjects into smaller groups, then compositing them together. One way portrait photographers like Annie Leibovitz light large-scale group photos is by lighting smaller groups by themselves and then compositing everyone together into a large group. Photographer Barry Harley recently employed this technique with relatively affordable gear for a group photo with friends while on vacation. Harley, his wife, and a group of friends were on a week-long vacation at Duns Castle in Scotland. The ancient site was the perfect location for an epic magazine-style group photo. In Harley's camera bag was an older Canon 5D Mark II DSLR (~$600 used these days), two Yongnuo YN-560 II flashes (which currently cost about $75), a PocketWizard, and a 43-inch Westcott bounce umbrella (~$20). The group had brought along outfits specifically for the photo shoot, and upon arrival, Harley decided to shoot the portrait on the main entrance stairway of the castle. The article walks you through all of the steps with photos. It's really kind of amazing. Those interested in learning about the state of Unmanned Aircraft Systems should follow the news out of Drone World Expo, opening in San Jose, CA on Oct. 3. As the conference organizers explain it, "Drone World offers real-world solutions to your business and environmental challenges. UAS/UAVs provide the capability for you to capture data in a way that will have a tremendous impact on your business. Applications including imaging, photography, video and film, precision agriculture, construction, security and public safety, mapping and surveying, inspections, research and conservation, communications, parcel delivery, and humanitarian efforts." Speakers include high ranking U.S. government officials such as Michael Kratsios, Deputy Assistant to the President and the Deputy U.S. Chief Technology Officer at the White House; tech specialists such as Eric Mueller, Aerospace Engineer, NASA; plus business leaders and enthusiasts. If you're in the San Jose area, you may want to attend in person. You can register here. Otherwise, I'll be on the ground and will share the tidbits that I find interesting. I've used the Elgato Cam Link for my last two Nimble Classroom events, and it has performed like a champ. In fact, after the last class, one participant even commented on how good the live action video looked. What is it? It's a $129 interface about the size of a thumb drive that converts HDMI output from your camera to USB for your computer. 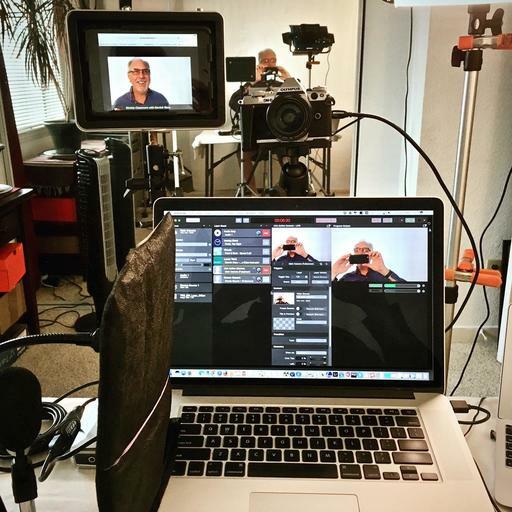 In my case, I'm using an Olympus OM-D E-M5 Mark II, which has an HDMI port (the mini size), then connecting the camera to my MacBook Pro via an HDMI cable and Cam Link. I chose the E-M5 Mark II because is has terrific video controls and clean HDMI output. In other words, it will send just the feed without menu icons and other distractions. Plus, it doesn't automatically shut down after just a few minutes like some cameras do. I'm using mimoLive by Boinx Software to produce my live classroom. It allows me to seamlessly switch among live action cameras, audio sources, and screen capture. Plus it can record to disc at the same time it's streaming live to my audience. And Cam Link works perfectly with it. The main gotcha with Cam Link is to pay close attention to the hardware requirements for your computer. It requires a 4-core Intel processor and USB 3. Compare the specs of your potential computer to the minimum system requirements published by Elgato. Other than that, all you have to do is get the correct cable, then start streaming. Elgato Cam Link was the missing link for my live action classroom. For a $129, I consider it a terrific value. 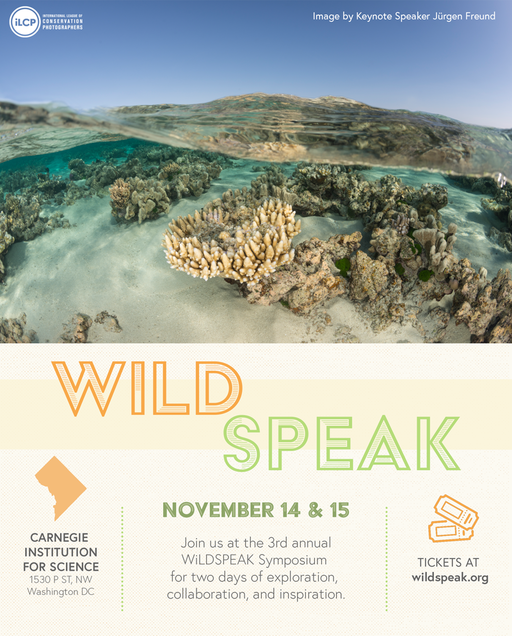 Registration Open for WildSpeak 2017 in Washington D.C.
WildSpeak will take place at Carnegie Institution for Science on November 14 and 15. Presenters include top naturalists, biologists, and nature photographers who have been immersed in their particular specialities. They share their findings in a series of presentations over the two days of the event. Plus, you'll learn how you too can participate in the world of conservation photography. Be sure to allow enough time during your visit to explore places in D.C. such as National Geographic headquarters and the Museum of Natural History at the Smithsonian.